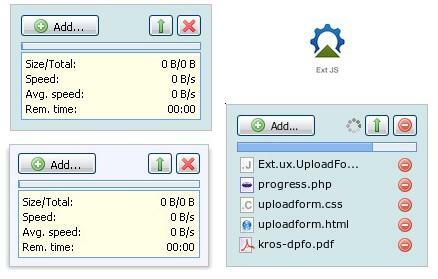 Ext.form.BasicForm extension for easy upload of (multiple) files to a server. The files are added to a queue first then they are uploaded to the server. Files can be removed from queue individually before upload or whole queue can be cleared. Result of upload is shown for each file by the success or failure icon and, in the case of a failure, the server error message is shown as tooltip of the failure icon.